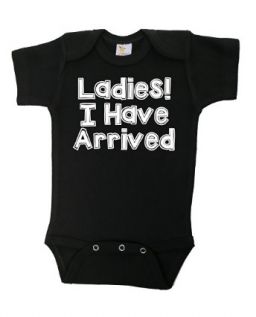 I am soon to be a great grandma, my great grandson is due in just a few weeks and I can't wait for him to wear The Baffle "Ladies I Have Arrived" onsie that I've recently had the opportunity to try out. This onsie is co cute!!! It's black with white lettering and is tagless for the babies comfort. Made of cotton, it's soft against baby's skin. Plus it has expandable shoulders, so much thought went into making this onsie. I'm so excited for my handsome little man to wear it! 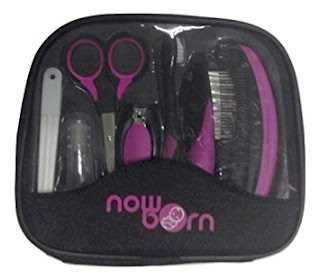 No nursery is complete without a grooming set for the baby.NowBorn Grooming Kit has everything to meet baby's grooming needs, a soft bristle hair brush, safety scissors,nail clippers, nail file, a toothbrush, and a silicone finger toothbrush. Plus it all fits into this cute carrying case. The handles are all a slip grip that ensures a good grip especially important when using the nail clippers and scissors.